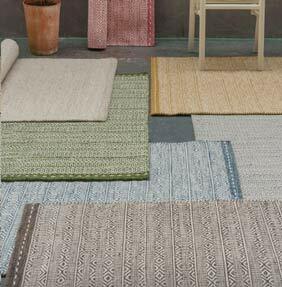 Taking inspiration from the traditional Indian dhurrie, each Knox rug is lightweight and is fully unbacked for an informal and casual addition to the modern home. The Knox rug range by Asiatic Carpets incorporates very simple geometric designs with muted colourways to create simple and easily portable rugs for many different spaces in the home. There are eight colours available in total including deep green, bold ochre and gentle coral. Each Knox rug is made up of a combination of materials: 73% wool, 14% cotton, 9% polyester and 4% viscose. Each one is woven by hand for a quality finish and they come in a choice of three different sizes to suit the home.